The 130 GeV monochromatic gamma-ray emission from the galactic center detected by the Fermi satellite may be a signal of dark matter. Until last week the claim was based on freelance analyses by theorists using publicly available Fermi data. At the symposium last week the Fermi collaboration made the first public statement on the tentative line signal. Obviously, a word from the collaboration has a larger weight, as they know better the nuts and bolts of the detector. Besides, the latest analysis from Fermi uses reprocessed data with the corrected energy scale and more fancy fitting algorithms, which in principle should give them a better sensitivity to the signal. The outcome is that you can see the glass as half-full or half-empty. 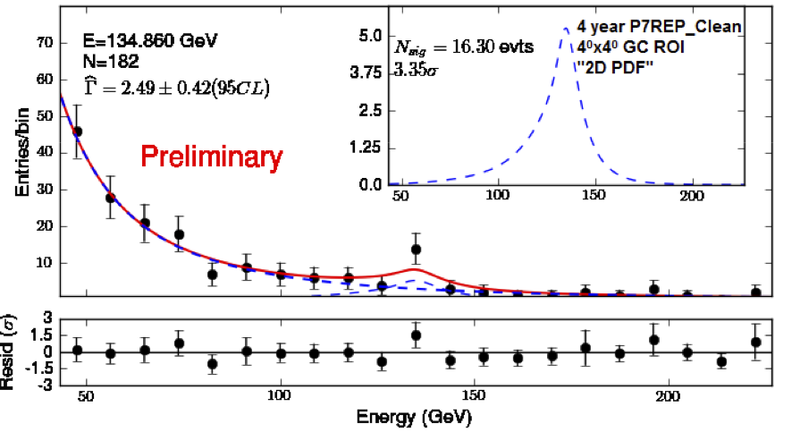 On one hand, Fermi confirms the presence of a narrow bump in the gamma-ray spectrum near 130 GeV. On the other hand, certain aspects of the data cast doubt on the dark matter origin of the bump. Here are the most important things that have been said. 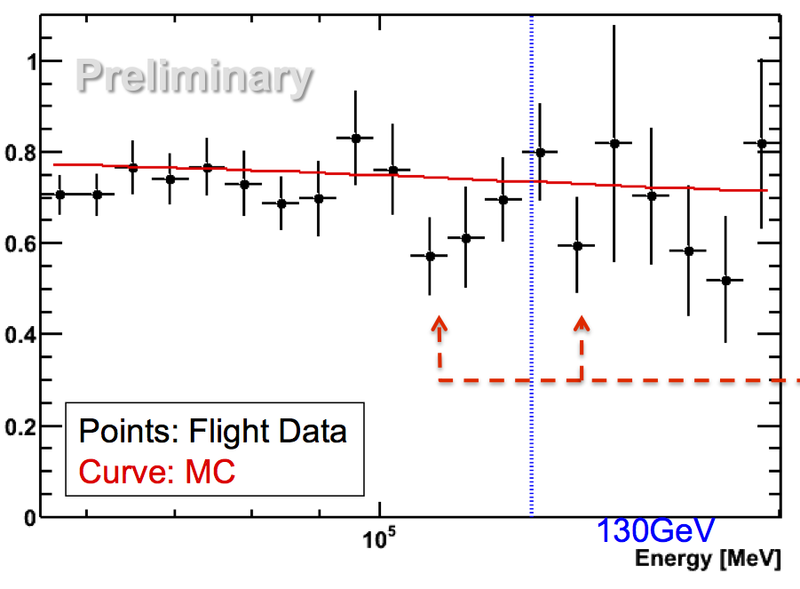 Recall that Fermi's previous line search in 2-years data didn't report any signal. 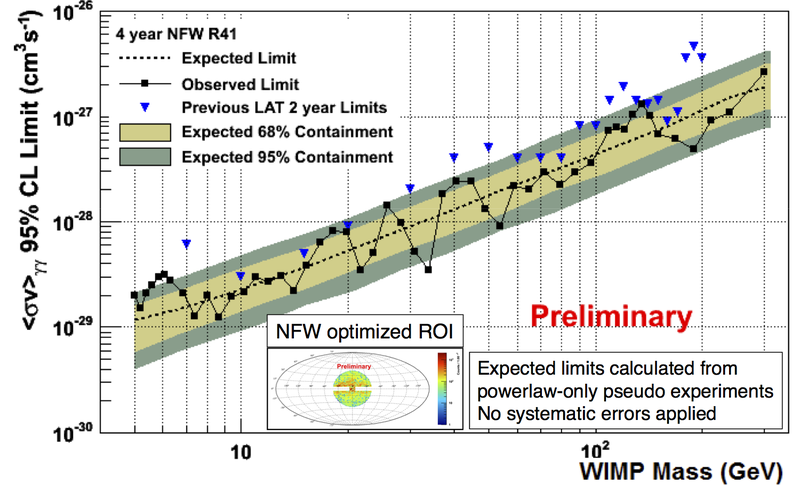 Actually, neither does the new 4-years one, if Fermi's a-priori optimized search regions are used. In particular, the significance of the bump near 130 GeV in the 12x10 degree box around the galactic center is merely 2.2 sigma. There is no outright contradiction with the theorist's analyses, as th e latter employ different, more complicated search regions. In fact, if Fermi instead focuses on a smaller 4x4 degree box around the galactic center, they see a signal with 3.35 sigma local significance (after reprocessing data, the significance would be 4 sigma without reprocessing). This is the first time the Fermi collaboration admits seeing a feature that could possibly be a signal of dark matter annihilation. Unfortunately, Fermi also confirms the presence of a 3 sigma line near 130 GeV in the Earth limb data (where there should be none). 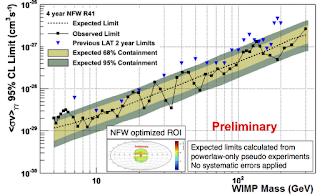 Fermi assigns the effect to a 30% dip in detection efficiency in the bins above and below 130 GeV. 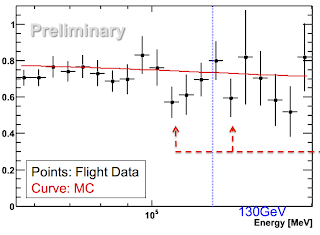 This dip cannot by itself explain the 135 GeV signal from the galactic center. However, it may be that the line is an unlucky fluctuation on top of the instrumental effect due to the dip. Fermi points out a few other details that may be worrisome. 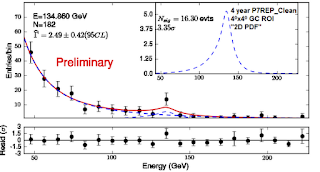 They say there's some indication that the 135 GeV feature is not as smooth as expected if it were due to dark matter. They find bumps of similar significance at other energies and other places in the sky. Also, the significance of the 135 GeV signal drops when reprocessed data and more advanced line-fitting techniques are used, while one would expect the opposite if the signal is of physical origin. A fun fact for dessert. The strongest line signal that Fermi finds is near 5 GeV and has 3.7 sigma local significance (below 3 sigma with the look-elsewhere effect taken into account). 5 GeV dark matter could fit the DAMA and CoGeNT direct detection, if you ignore the limits from the Xenon and CDMS experiments. Will the 5 GeV line prove as popular with theorists as the 130 GeV one? So, the line is sitting there in the data, and potential consequences are mind blowing. However, after the symposium there are more reasons to be skeptical about the dark matter interpretation. More data and more work from Fermi should clarify the situation. There's also a chance that the HESS telescope (Earth-based gamma-ray observatory) will confirm or refute the signal some time next spring. A bump at 5 GeV would correspond to a WIMP at ~8-10 GeV, i.e. right around the region of interest for CoGeNT and CDMS. Sorry, anonymous, I surely like the CoGeNT+CDMS hints as well, but concerning your sentence, wouldn't a bump at 5 GeV correspond to a WIMP at 5 GeV? ;-) WIMP+WIMP to gamma+gamma is the only sensible channel here, isn't it? Evidently 5 GeV could also fit the XENON100 direct detection (1208.5046), with a factor ~50 smaller cross section than DAMA/CoGeNT. I have a question ! It is probably obvious for most of the (very qualified) audience of this blog but I would be very glad to have more information. Anyway, thanks for the post, I found it very interesting ! Afaik, there's no model connecting the 130(5)GeV Fermi line to the 125 GeV Higgs. Hi Lubos. See Fig.2 in arXiv:1201.1303. The 2nd figure is from Eric Charles' talk in the parallel session. No mention of or link to arXiv:1210.3013? Any idea where one can find the slides from the Charles and Bloom presentations mentioned in the Albert talk?